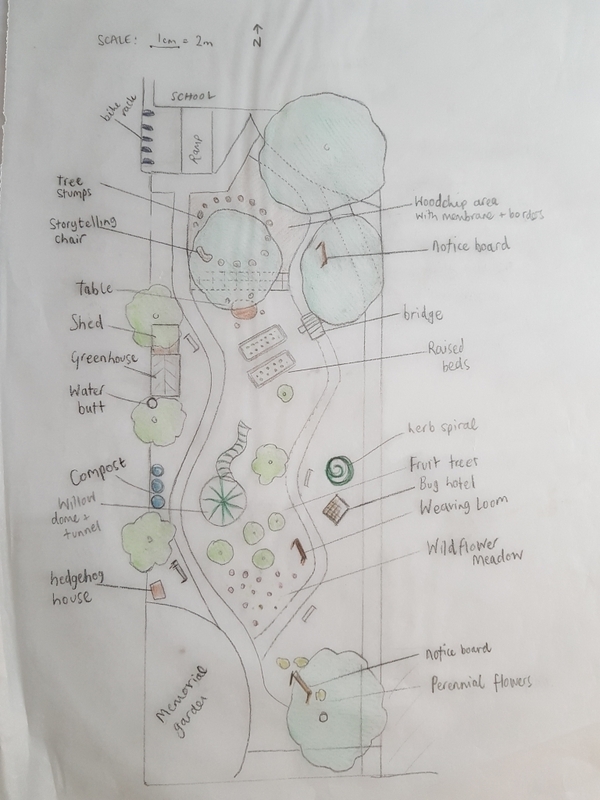 I worked out approximate dimensions of each element to see how they would fit into the design of the garden. I took these ideas and put them into a document to email to the school, and arranged my next meeting to hear their views. (You can see the document below, click on the images to expand). After meeting with the head teacher again, we discussed some changes. The school now wanted to include bike racks for the children to encourage them to cycle to school. They also wanted to leave out the wildlife pond, as they were possibly going to have a larger one built at the back of the school one day. There were several other tweaks, which I took notes of and then re-worked the design plan. Based on this second meeting, I was able to put together a final design plan, with a base map of how the new garden would look. You can see this below (including my notes which I took on a further meeting to make some more tweaks and changes). Below is a larger view of the base map I created, along with some estimated prices.